Peace has been restored to Oz. The fallen Witch, Lynessa, and her sister, Zinna, are fading into memory like a bad dream, soon to be remembered only in tales meant to frighten children. But there is one witch that still draws breath in Oz and she has not forgotten the power of her masters or the evil that they left behind. Soon the people of Oz will face a foe more frightening than any enemy that has come before… The Warlord of Oz has arrived! 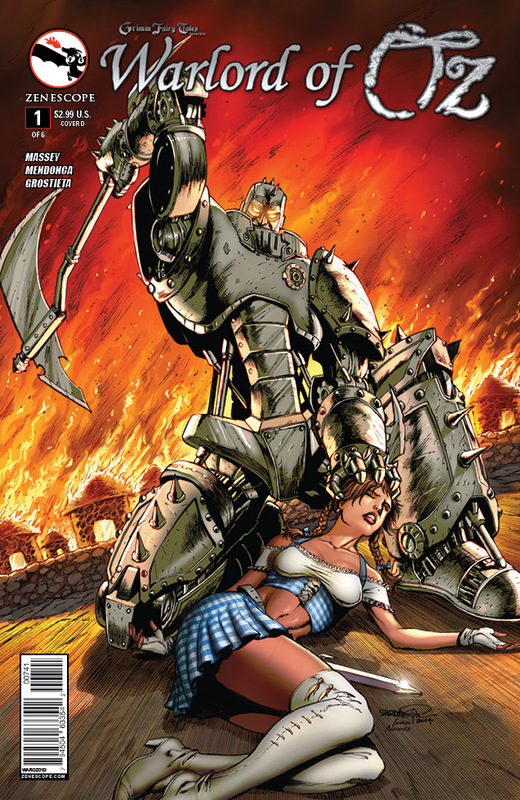 Warlord of Oz takes place after the events of Oz Volume One. There are many things that amaze me about the creative forces that dwell at Zenescope Entertainment, the least of which is their ability to take an incredible series (like Oz) and make an equally incredible follow-up. So often, a sequel in any form (comics, movies, etc.) will lack the spark or inspiration that made fans crave the original. Very recently, I re-read Oz (got my hands on the hardcover trade at C2E2) and was still very impressed with the story / series. 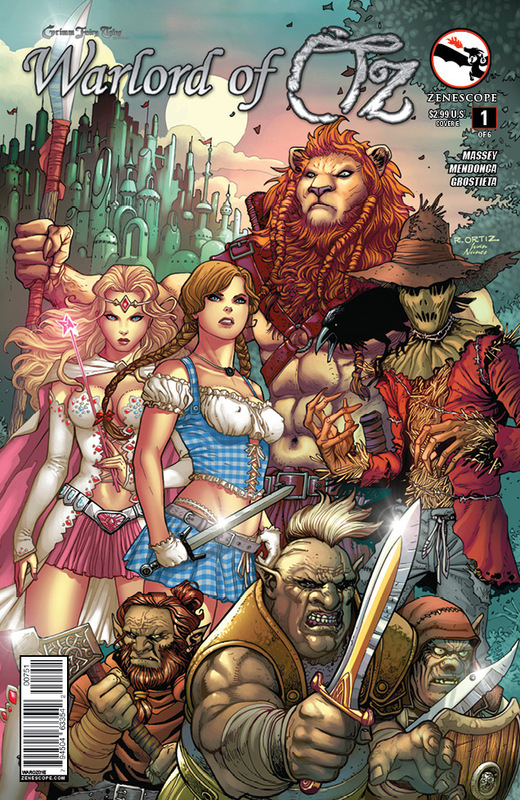 Knowing that the Warlord series was coming out soon, I wasn’t quite sure how the Oz creators could live up to the quality (in either story or art) of the originals (and sad to say, I have not read the Tales from Oz issues, so wasn’t quite sure on the story direction either). Warlord of Oz indeed lives up to the original and is a worthy sequel. Warlord picks up a little more than a year after the first six-part series. Dorothy is back on Earth and trying to reconcile this grand, fantastical, dream-like adventure she had with the day-in-day-out life of being a Midwestern farmer. If it wasn’t for Toto at her side, she very much might not believe her trip to Oz ever happened. In this first issue, authors Joe Massey and Jeff Brusha get the reader caught up on all of their favorite citizens of Oz and a general political update of the land. In the year that passed, peace and prosperity has all but eliminated the atmosphere of fear across the land, new allies have been introduced and while the main characters each have their own developing storylines, their friendships have done nothing but gotten stronger. During the course of this ish dark forces push forward with a two-pronged attack; in Kansas Aunt Em falls ill with an unearthly ailment that has the local doctors baffled and in Oz, an ancient foe steps out of the darkness and battles Glinda to a standstill in Bogg. And even though her own dreams foreshadow her own future dark choices, it’s time for Dorothy to find her place again among the heroes of the realm. Brusha and Massey layout a great issue that not only fully interweaves with the story scaffold of the previous series but also strongly stands on its own – I believe a reader could fully enjoy and embrace Warlord of Oz without reading the original series (in fact, it would make them want to go back and get it!). The art team, lead by Miguel Mendonca, creates a visually thrilling structure for the tale to unfold on – action sequences, highly detailed close-ups, gorgeous splash pages, brilliant page framing – Zenescope fans will not be disappointed! 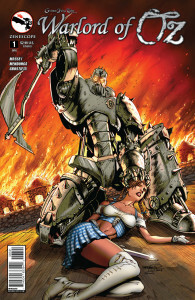 Warlord of Oz hits the stands this Wednesday – put it at the top of your pull list! The Bottom Line: Get this issue!